Hello, Gorgeous! : ILY Couture Basilissa Necklace & Bracelet Set GIVEAWAY!! 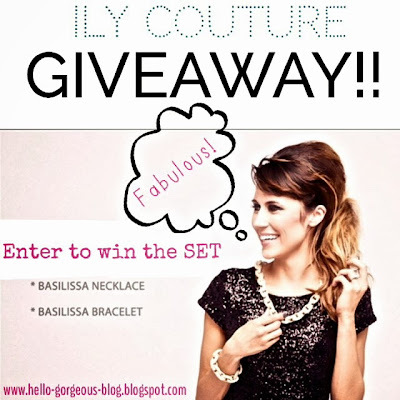 ILY Couture Basilissa Necklace & Bracelet Set GIVEAWAY!! I am currently suffering from a bit of blogger's guilt. I haven't updated in a week! Even though I've been posting my outfits on Instagram, every day this week I've meant to sit down and post outfit pictures with details and shop-alike links on the blog. 1. I was away at a work conference for part of the week. 2. I've been a little under the weather and asleep by 8 pm almost every night. The Basilissa Necklace AND Bracelet set from ILY Couture !!! Are you guys as excited about this as I am?! ILY Couture is one of my favorite online boutiques and this gorgeous pave link chain necklace and bracelet set has been on my must-have list for as long as I can remember. Now one lucky winner gets to call it their own! So, without further ado, use the Rafflecopter app below to enter to win the rockin' Basilissa set from fabulous ILY Couture! Thank you ILY Couture for the incredible giveaway!! The small print: Giveaway ends on Sunday October 27th and is open to U.S. residents only. Winner must claim prize within 48 hours. If prize is left unclaimed within this time, a new winner will be chosen. I would style it with my pink sweater, put some fleece leggings and my booties! I would also wear it with my blue polka dot top, some boots and cute jeans! :D I love ily couture! I would love to style these pieces with a flannel shirt, skinnies, and flats for a casual-glam look! With my birthday dress! I will be 26 on Tuesday! I was would dress it up with a nice jacket and designer bag. I have wanted this set since I saw it! I would wear it with everything!!! Black leather jacket, dark blue skinny jeans and hot pink button down shirt with riding boots. Thanks for the giveaway. The pieces are so gorgeous. I have an hour commute each way as well! It makes blogging consistently a challenge, so I feel ya! I would love this with my cool blue blouse and gray pencil skirt! I would wear these pieces with a white cotton button down blouse under an orange v-neck sweater, dark denim skinny jeans, and tan riding boots...love the 2 pieces!! with my birthday outfit in two weeks! This is the perfect accent for a fall outfit. Been looking for something like this. Love your blog! Ohhhhh... so so so excited! I would wear it with everything! - I am in desperate need of some glam in my life. *stuck in a jeans and t-shirt rut! Awesome giveaway! I would style with a chambray shirt and navy skinnies. I absolutely love this set. I have been eyeing it for weeks, so i can't believe you are actually giving it away. I would definitely style it with my black and white button up shirts or with my black sheath dress. I would style these with a white shirt under a black/patterned blazer and ankle jeans w/pumps. Gorgeous! I would wear this beautiful set a bright pair of skinny jeans, a buttondown shirt layered with a sweater, sleeves rolled up, and Merona flats. So gorgeous this set is! I hope I win! 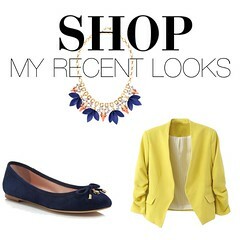 They are such versatile pieces, I would probably wear them with lots of collared shirts, sweaters, and blazers! This is a must. Especially with a magenta silk top and sleek black bottoms. I absolutely LOVE this set and have been looking for them for so long! I could honestly pair them with anything, but definitely a button up, cardigan, pixie pants, and riding boots for the autumn! Skinny jeans, black sweater and leopard heels! With any sweaters, button ups, skinny jeans, and boots or heels, this is perfect for work or play! Black skinnies, a loose white top, and a black leather jacket! I would wear it with dark skinnies and a graphic tee! I would wear this to help dress up weekend looks! I just bought a bunch of button-ups for work from Old Navy, and these items would be perfect with them! The would be perfect with skinny's, a striped shirt, a black leather jacket, and leopard flats! My new favorite look! I think this set would become my new "go-to" jewelry. I would wear it casually with jeans and a button down and with work outfits as well. This would be perfect for work outfits! would pair up with a black sweater dress I have. Love it!! Love your blog! been wondering where you were this week... hope you are feeling better and that you are taking some time for yourself! I too have been over worked lately and feeling a little less than healthy! Love the set! Perfect for the many holiday party outfits to come! I'd wear them with a higher neck, three quarter length top and a neutral skirt. I would pair this lovely set with some jeans a white button up blouse and my Steve Madden riding boots and my micheal kor watch!! I would wear it with everything. Such a fun set. Can wear with jeans and tshirt, dresses, casual work wear. Just in love. I would style it with a plaid button down shirt, jeans and boots. So cute! I don't have much in my collection, just starting out. But I think this would look nice with a solid color button down short. I would wear this necklace and bracelet with the lovely Banana Republic Issa Collection dress I just bought! I would wear it with a cobalt blue silk flowy blouse, black faux leather pants and strappy heels! I love this necklace/bracelet combo! Thanks for the giveaway, Yasi! I would wear this with EVERYTHING!! I feel like I would wear with anything too... but to be more specific, I'd wear against bright blouses layered with sweaters for work! LOVE the set! Would style it with a button up white shirt and gap sweater on top w jeans and awesome flats!!! I would style it with black skinnies, a chambray shirt with a sweater! Lovin' the look! I have admired these for a while now! Great piece that will go with anything! I would just wear it with a plain white or black tee,dark skinnies and some funky flats! Looking forward to winning this! Pick me pick me!! !